Gambling is the opposite of Economics. In Economics, it all comes down to organised and logical thinking whereas in gambling, everything is left solely to chance. Coincidence or not, this brunch was actually the result of a gamble. My buddies T, K, R and myself were going on a holiday together to Australia(Sydney’s Tetsuya I’m looking at you) with R’s mystery friend S, whom T, K and myself had no prior interaction with. So, this was kind of our introductory meeting to get to know one another. It was a gamble that our new found buddy would be interesting(chio would be a bonus and a separate gamble in itself), without any attitude problems. 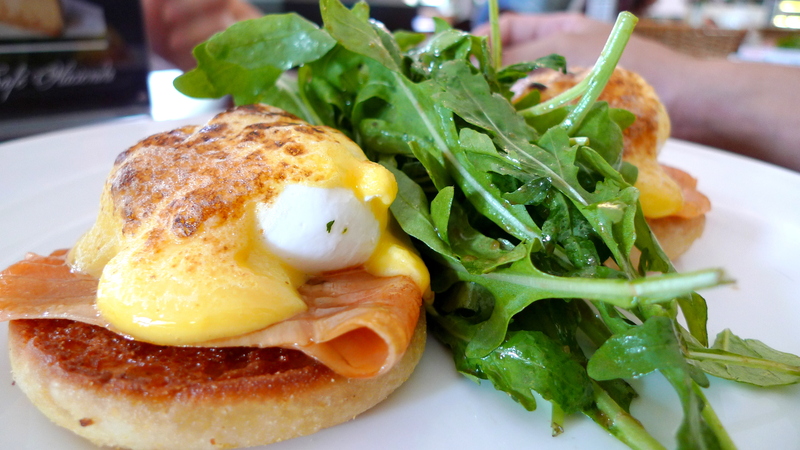 It’s such a common sight at brunch places and yet it never fails to pose for a great picture…the Eggs Royale($13.50++) aka Salmon Benedict. S couldn’t decide on what she wanted, so she ordered Eggs Any Style($13.50++). She was taken aback when she was asked what style she wanted, alas she thought that Eggs Any Style was really a dish’s name which could save her from making any choices. Well, normal unbimbotic people can also make such mistakes…NOT! Served with a sole Pork Sausage, Scramble Eggs(choice of poached, scrambled or sunny side up) and 2 Triangular Toasts, it really makes for quite the unworthwhile brunch meal since S ate something similar to that during her self-made breakie. It didn’t help that the Sausage was bland and reeked of an overdose of herbs. 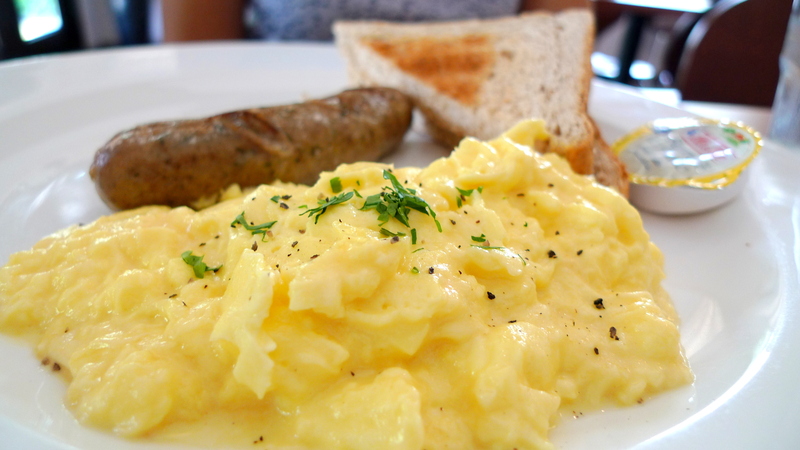 The Scrambled Eggs was creamy but average at best. 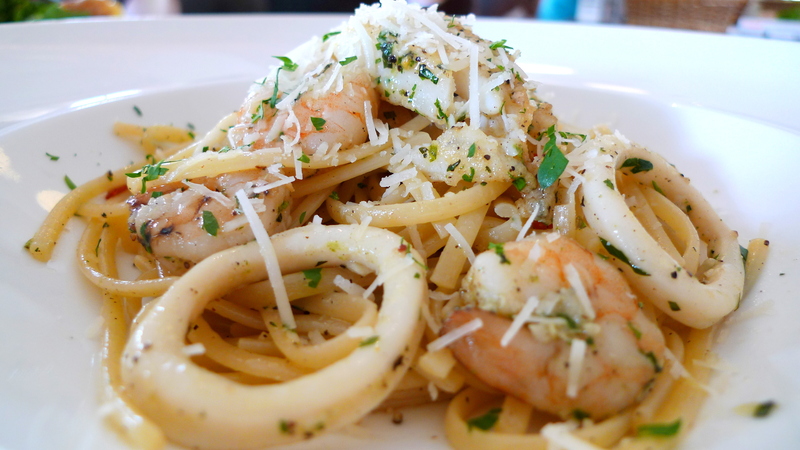 T had the Seafood Aglio Olio, a Today’s Special not found on the menu. On his request for less oil and salt, it was just barely passable and I found the spiciness a bit too strong for me. 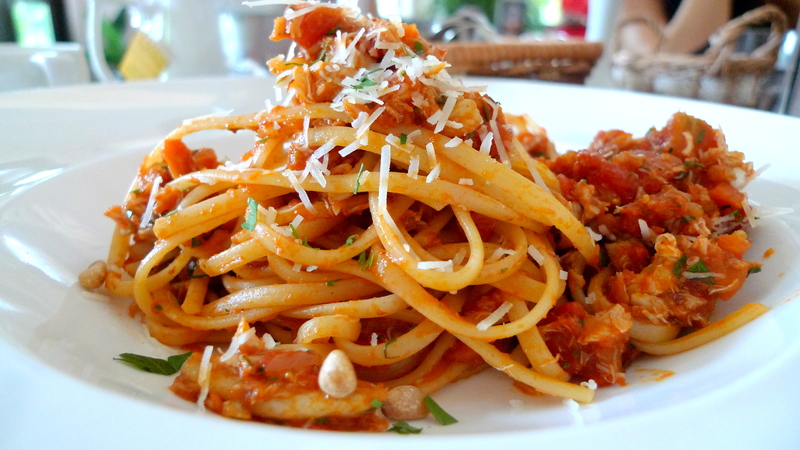 For myself, I had the Spicy Crabmeat Linguine($22++). I found the rendition here a bit too dry and not creamy enough. Not as good as the other same price-ranged crabmeat pastas I have had recently at Riocotti and Etna’s. I’m glad everyone loved my recommendation for the Sticky Date Pudding with Butterscotch & Vanilla Ice Cream($10++). 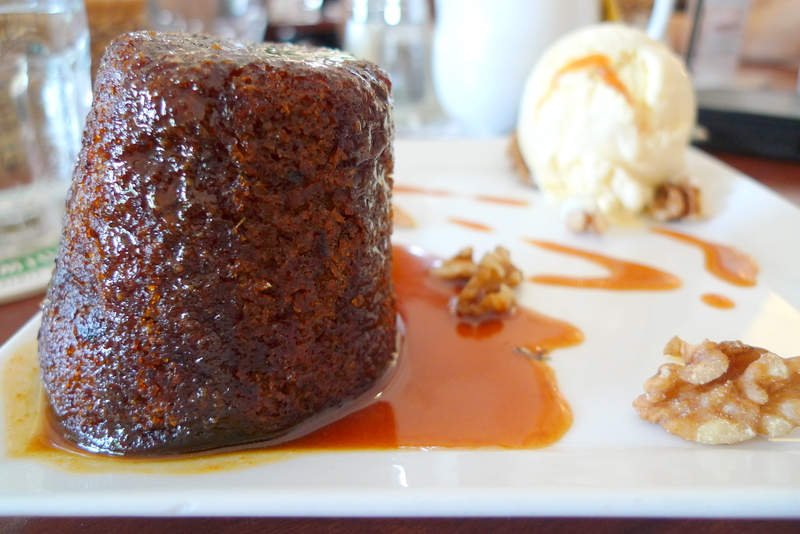 It’s quite foolproof actually, I haven’t eaten a bad tasting Sticky Date Pudding yet, especially when it’s doused with Butterscotch and Ice Cream. The warm pudding here is the totally moist kind, if you prefer the kind with a crisp outer layer with a moist interior, I would recommend the one at Chalk @ Mount Sophia Old Skool. 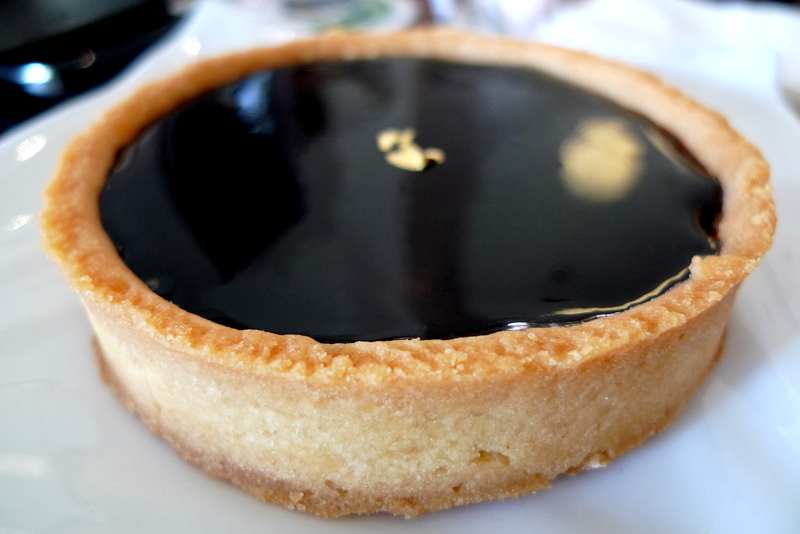 R took a fancy to the Chocolate Tart($7++). Having eaten at Laurent Bernard’s Chocolate Bar @ Robertson Quay last week, I dismissed this one rather quickly. I felt that the bittersweet dark chocolate here lacked fluidity and the tart base wasn’t buttery and artery clogging enough. Sometimes, Economic reasoning might not triumph gambling in attaining the best results. Cafe Hacienda was sorely disappointing this time round while S proved to be the Jackpot. Let’s pray our lucky gambling streak continues in Australia’s Casinos…and I can use the winnings to eat more yumyums! thx! yesh i have heard of it and it’s definitely getting priority on my to-eat list now since u recommend! 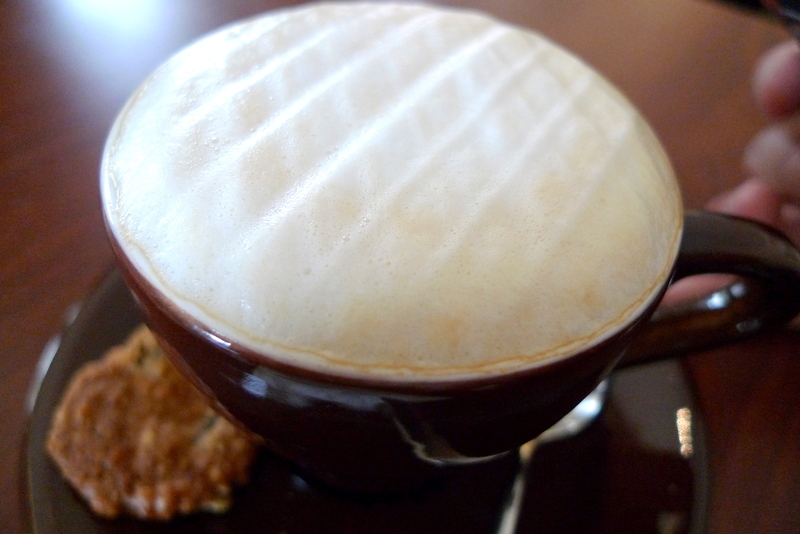 OHMYGODDDDDDDDD CAFE HACIENDAAAAAAAA :(((((( YOU ARE MADLY TEMPTING ME WITH GOOD FOOD WHEN I’M HAVING EXAMS. I AM GOING FOR BRUNCH ASAP AFTER THE HORRID EXAMS.